VMware's Partner Exchange kicks off today in Las Vegas. I'm not at the conference, but I'm getting updates via twitter from folks who are attending. VMware's Partner Exchange kicks off today in Las Vegas. I'm not at the conference, but I'm getting updates via twitter from folks who are attending. Interesting updates are coming from Donn Bullock about the desktop virtualization element of the opening keynote. I'm also excited when the lowly desktop gets center stage, and VMware is doing a great job rallying their partners around their desktop momentum. But it's important to remember that data in marketing slides needs to be taken with a grain of salt. 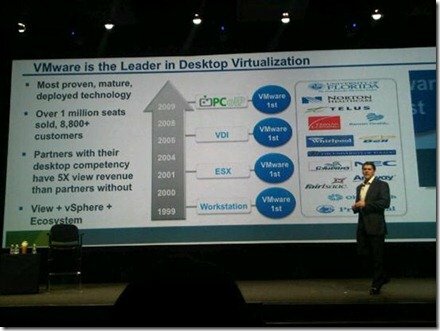 A later photo from Bullock shows that VMware is claiming "over 1 million" View seats sold. Of course we don't know if that "over 1 million" number means 1,000,001 or 1.1m or 1.4m or what. But my guess is that it's less than 1.2 or so or else VMware would have said 1.2. The problem is that this slide is titled "VMware is the Leader in Desktop Virtualization" and the first bullet is "most proven, mature, deployed technology." Really? My quick math shows that if 1% of 650m desktops are virtualized, that's 6.5m current. But VMware only has 1m or so, which is about a 16% market share. So how does that make them the leader? 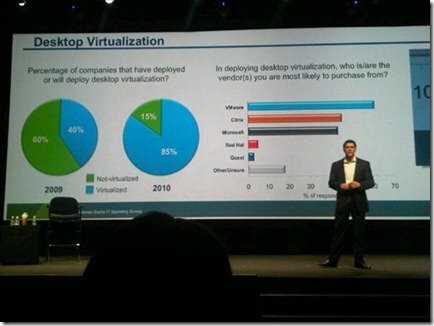 The speaker said that VMware was preferred over Citrix or Microsoft for desktop virtualization, and as proof used the bar chart on the right. The title is "In deploying desktop virtualization, who is/are the vendor(s) you are most likely to purchase from?" Of course the results show VMware in the #1 position. But the fact that the question allows multiple answers (since the question phrasing is plural and the bars add up to more than 100%) means that most users probably checked the "VMware" box since they'll be using vSphere, and then also checked the box for the desktop virtualization product they'll run on top of vSphere. Heck, look how big Microsoft's bar is! They don't even have a real desktop virtualization solution, which suggests that users checked the "Microsoft" box because they're using Windows. So a customer planning to use VMware View would probably check "VMware" and maybe "Microsoft." A customer planning to use Citrix XenDesktop on vSphere would check "Citrix", "VMware", and possibly "Microsoft," etc. The point is it's obvious that VMware would come out on top here. Make no mistake: The vast majority of today's VDI environments run on ESX and vSphere. VMware deserves all the credit and kudos for that. But this presentation is them furthering the idea that since they're the best server virtualization and hypervisor company, they will also be the best desktop virtualization company. And that's a cognitive bias that can be dangerous. Desktops are not servers. Period. In addition to your observations, it is conspicuous that they chose the metric "seats sold" versus "seats deployed." I wonder how many of those seats are shelfware. I'd suggest at least half licenses sold are still shelfware. This applies to Citrix just as much as VMware. What is more interesting is that (taken at face value) if VMware 16% of the market who has the rest? Certainly not Citrix, which means that VMware are broadening desktop virtualization to include technologies that don't fall into the badly defined bucket that we call VDI. Well, Ncomputing just deployed their two-millionth device a few months ago, and 100% of theirs are for desktop virtualization. These two below comments from VMWare's Q4 earnings don't put much credibility to whats on the above slide from PEX. In the desktop space, Nielsen acknowledged Citrix Systems Inc. as the incumbent and conceded that VMware's View 4 has yet to contribute materially to its revenue. "We are early in the desktop virtualization market, and the pace of growth is unknown," he said. In Q4 60% of the proof of concepts that our pre-sales technical team conducted were centered on virtualize-ing the desktop. This said, I want to reinforce that we are early in the desktop virtualization market and the pace of growth is unknown. Though we are expecting strong revenue growth from desktop in 2010, it is still off a relatively small base. @ Doug and Simon - I know that a few companies have at least received quotes for VMware View licensing just because it was possibly cheaper to procure for a VDI scenario (using MS, Citrix, Quest etc) rather than buying ESX outright. I would take these graphs with a grain of salt personally. For those astute students of VMware pricing policy, back in the VI3 days it was cheaper to buy VI3 bundles with View than without it. Not so much the case today, but it's not something that sales teams look to extract much value from, either. What a bunch of garbage. 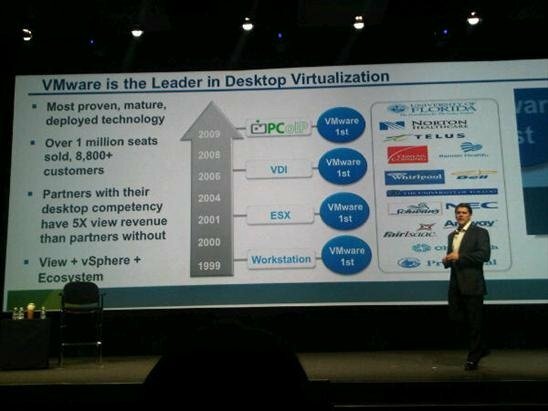 I love VMware's stance on how they are the market leader in VDI and how they actually got there. Any of you guys look at your VMware ELA's carefully? VMware has been giving away view licensing in the contracts and considering them sold and deployed Virtual desktops. Why would you need a truck to tour the country to demo a virtual desktop that should be accessible from anywhere in the world? +1 to Adam for pointing out that only a marketing genius (probably an MBA) decides to get a truck to drive around the country to show virtual desktops that are by definition available anywhere in the world. Remember Adam Sandler on the SNL segment "Stand up and Win" with Jerry Seinfeld? All he could say was "Who were the ad wizards who came up with this one?" Oh can we at least pretend to be a little neutral here. I come here for real comment. Next they wont be allowed to have conferences because they should all be virtual. How about real conferences, but all the hardware to run them is virtual? And that was Citrix's truck? Not nearly as cool as VMware's. I like your thoughts Brian. Enjoy real conferences. Put 50 Sunray,s in and connectthem over a router through a 2Mbit internet connection and run over 10.000 sessions with them by starting the sessions somewhere in the world. Now you only need a car to get those 50 sunray's and screens in. That makes me think. HMMM. Yep, can be done. This game is more like CVS/Ritaid/Walgreen. Build to block not to serve. Is that what is best for the community...certainly not. Determine if there is a need and test the solutions that meet your needs. If VmWare has 1Million seats, and NComputing has 2Million Seats, how can VMWare be the "leader in desktop virtualization?" Bottom line is for all they hype and marketing $ VMWare has thrown at the desktop space, they are loosing due to cost and complexity.